(Nanowerk News) Scientists are using biology to improve the properties of lithium ion batteries. Researchers at the University of Maryland, Baltimore County (UMBC) have isolated a peptide, a type of biological molecule, which binds strongly to lithium manganese nickel oxide (LMNO), a material that can be used to make the cathode in high performance batteries. The peptide can latch onto nanosized particles of LMNO and connect them to conductive components of a battery electrode, improving the potential power and stability of the electrode. The researchers will present their results at the 59th annual meeting of the Biophysical Society, held Feb. 7-11 in Baltimore, Maryland. 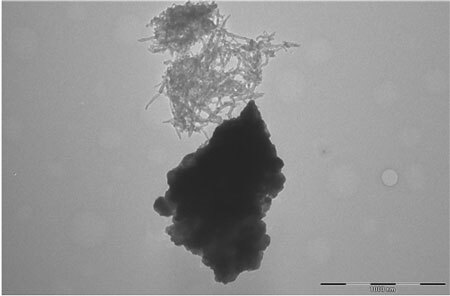 Figure 1a: This figure shows lithium manganese nickel oxide and carbon nanotubes clumping separately, with no specific interactions. However, when a multifunctional binding peptide is added to the mixture, as shown in Figure 1b below, the peptide binds the dispersed carbon nanotubes to lithium manganese nickel oxide particles. "Biology provides several tools for us to solve important problems," said Evgenia Barannikova, a graduate student at UMBC. Barannikova works in the lab of Mark Allen and studies how biological molecules in general can improve the properties of inorganic materials in batteries. "By mimicking biological processes we can find the better solution," she said. One of the problems currently facing battery researchers is the difficulty of working with nanoscale materials, which due to their extra tiny size can be hard to control and hold in place. The frustrations of working with nanosized materials are worth overcoming, however. Nanostructured electrodes in Li-ion batteries have several advantages over bulk material electrodes, including shorter distances for charge-carrying particles to travel and a high surface area that provides more active sites for electrochemical reactions to occur – all of which translates to batteries that are lighter and longer-lasting. To take on the challenge of manufacturing on the nanoscale Barannikova and her colleagues have turned for help to biological molecules called peptides. Themselves made up from strings of molecules known as amino acids, peptides are naturally occurring and bind to many different types of organic and inorganic materials, depending on their sequence of the amino acids. They play many roles in the human body, from signaling in the brain to regulating blood sugar, and some drugs, like insulin, are made up of peptides. One of the inspirations for her research, Barannikova said, was the way that organisms such as mollusks use peptides to control the growth of their shells. They demonstrate remarkable control in order to build intricate nano- and macrostructures from inorganic materials like calcium carbonate, she said. The researchers borrowed the general approach of the mollusks, but had to employ some lab-bench wizardry to find the appropriate peptide. No snail, after all, makes its shell from lithium manganese nickel oxide. Barannikova and her colleagues used a procedure called "Phage Display" to screen more than one billion possible peptides in search of one that would stick strongly to lithium manganese nickel oxide. The "peptide library" through which the researchers searched is commercially produced by a laboratory supply company, and contains a vast number of randomly combined amino acid sequences incorporated into a protein made by a virus called the M13 bacteriophage. The researchers isolated a peptide that binds to lithium manganese nickel oxide by combining the library with a sample of the metal oxide and then repeatedly washing away the peptides that didn't stick to it. 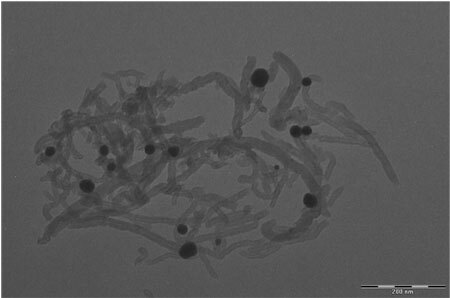 The researchers then combined the newly-discovered peptide with a previously isolated peptide that binds to carbon nanotubes. Carbon nanotubes can serve as conductive nanowires in Li-ion electrodes. The resulting peptide could then form a bridge, binding to both the lithium manganese nickel oxide nanoparticles and the carbon nanotubes and keeping them close to each other so that they can maintain a connection through multiple charging cycles. By helping to maintain a highly organized architecture at the nanoscale, the researchers expect that their peptides will improve the power and cycling stability of future Li-ion batteries, allowing them to be smaller and maintain longer lifetimes. The team is currently testing how well the new cathodes perform. Going forward, Barannikova plans to make an anode with similar techniques and to integrate the two components. "I hope to demonstrate an entire biotemplated battery in my Ph.D. thesis," she said.